Outdoor lighting has so many appeals. With it, you can extend your living space to the great outdoors. It’s also good for security. Use it for patio lights, pool lighting, path lighting, al fresco kitchens, hot tubs, gazebos, and more. And the best way to go green with your outdoor lighting is with LED lighting technology. This lighting technology uses a small fraction of typical electric usage. Plus, they last longer, which reduces waste substantially. When spring and summer roll around, it’s time for some summer backyard barbeque parties with your friends and al fresco Sunday dinners with your family. You’ve got the patio furniture set in place, a grill ready to fire up and a big table for dining. What’s missing? The outdoor lighting is missing. With some eco-friendly illumination using LED lighting, you can ramp up the mood and keep that party going. Skip the candles, Tiki torches, and lanterns. Get a well-designed lighting scheme with LED technology to light up your patio or deck. Bring in some moonlight with LED technology for your al fresco kitchen. Moonlighting offers a gentle wash of light over the al fresco kitchen with intriguing shadows and dappled lights. If your kitchen area includes a sitting wall, you could install LED lights under the caps to shine on patio edges and stairs. Professional bistro lighting is high-quality outdoor lights that include LED bulbs with protected cords. It’s even dimmable so that you can set the perfect mood and you can even create the perfect atmosphere right from your smartphone. LED lighting systems can transform your pool into an aquatic experience. Customized LED lighting packages add a soft glow and can even have computerized color gadget that changes the color. Go blue for a martini party and red for Valentine’s Day. Plus, there are fiber-optic lighting options for a starry night-like effect. Strategically placed LED lights give outdoor trees a sculptural quality and can splash lights onto the pathways that lead to the pool. Adding lighting to your pool allows you to safely take a dip at night. Good lighting is intended to enhance the nuances and shadows of a garden. Garden lighting should complement your garden design. Light fitting using LED technology is the ideal solution to accentuate your garden’s features. LEDs are available in cold or warm light and come in different colors. LED light fixtures create a sharp-edged light pattern that is ideal for showcasing your garden’s features. A lighting professional can help you plan the right lighting for your garden to achieve your desired effect. This way, you can make the most of every minute outdoors. A simple stone wall can take on a whole new personality when the sun goes down if grazed with light and shadow. Wall washing and light grazing are two common techniques used to add visual interest to a textured surface, such as a stone wall. LED luminaires can be mounted at the top of the stone wall or above the strike of the wall to create shadows and add textures. They can also be placed at ground level for an up-lighting effect. This technique is known as light grazing. Wall washing turns the wall into a bright background and creates a wider angle between the light and the wall. Bluetooth technology can also be integrated into smartwatches, tablets, and smartphones. This allows for easy, flexible light adjustment to satisfy your lighting requirements. From selecting the right outdoor lighting fixtures to incorporating controls, planning, and attention to detail can create a beautiful residential landscape design that keeps ambiance, functionality, and safety in mind. Imagine how the outdoor space will be used. Try to visualize how your outdoor lighting will look at night. Choose the right fixture design. Understand the different types of fixtures, as they will impact the final look. For example, flood light fixtures create a wide beam while bullet fixtures project a narrow beam. Also, strongly consider using LED lighting. LEDs are designed to withstand inclement weather and have a long lifespan. They are also extremely efficient, which translates to lower operating costs. Plus, they can be dimmed or brightened to create extra layers of subtle and complex lighting effects. When you use LED lighting technology, it’s easy to go green with lighting your home outdoors. Turn to the lighting experts at Enhanced Outdoor Lighting & Design for all of your outdoor lighting needs. Our LED fixtures come with a 15-year warranty. 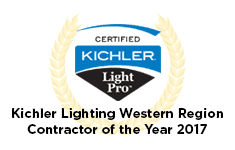 Also, our experienced and knowledgeable lighting teams will design the perfect project for your home. From start to finish, our team works closely with clients. Let us create a design that you will fall in love with. Give us a call today for a consultation.